On that day in October 2017, the league table painted a very different picture after eight games for Liverpool’s manager. The Reds were in eighth place with 13 points, already nine behind the runaway train that was City and seven behind Old Trafford’s sceptre. The defensive solidity on display that day was reassuring but just a mirage as the very next week Liverpool were obliterated by Tottenham at Wembley. They had conceded 16 goals in the league, their worst defensive record after nine top-flight games since 1964-65. What a difference a year makes with only three conceded in the first eight. Klopp is now even more capable of dousing the afterburners when a big game comes up. Liverpool created as little on Sunday against the blue half of Manchester than they did in that bore draw a year ago, but the signposts were clear that he can set his stall out against a dangerous opponent rather than try to blast them off the pitch. 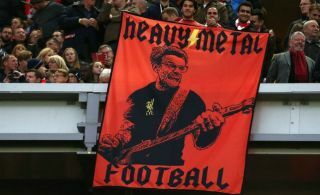 Klopp is now beginning to create a Liverpool that can mutate into more than a thundering hooves horse that tires down the long Grand National straight. The squad strengthening across the summer certainly helped, but the mindset has also changed in that the “basketball” style game that Jamie Carragher cited has been modified. After that bonkers 3-3 draw at Arsenal in December, Carragher said: “They’re always involved in games that are end-to-end. It’s great for us (as broadcasters), they’re great to watch but you’ll never get far because we’re all in those situations as players you have to find a way in a hostile stadium to kill the crowd”. Liverpool are an “emotional” team. Think PSG at Anfield in the opening matchday of the Champions League as evidence of that whirl of uncertainty. However, Klopp has been a little more restrained in his facial expressions, more restrained in his immediate interviews after a match. It looks like he is playing the long game. And the long game is the only way to win the Premier League. The goalless draw on Sunday, billed as the Challengers against the Champions, was a statement by the Reds, but not in the way the viewing audience expected. Klopp was essentially setting up to say: “We are here to stay, so we don’t have to blow you away today.” Andrew Robertson did not maraud forward anything like as much and the Scot’s mega pressing of City that thrilled the faithful at 4-1 up in the game 10 months ago was just a distant memory. Brendan Rodgers teams used to win 4-3 too but when it came to killing the game, there was no way to shut down the madness. We will score more than you may have been a mantra that Manchester United best Sir Alex’s teams could carry out, but the top six are now under the tutelage of super coaches who are far too smart. The 51-year-old knows that his Lufthansa will have to conserve fuel rather than take off at anything that moves. Even when Alisson attempted his Cruyff turn to put Leicester right back in the game last month, there were still almost 25 minutes left for Leicester to grab something. But they barely laid a glove on the Reds who saw the game out in a hitherto unseen ugly way. Three years on from his autumnal installation in 2015, the believers are beginning to see something that might come good before their own eyes. Heavy metal is just beginning to tone down to softer rock.